The main stadium of Pardubice was built in March 1931 after an extremely fast construction, launched as late as October of the previous year. Its football field was surrounded with a 400-meter running track, which in turn was surrounded by a cycling track. At that time it was regarded as one of the best not only in Czechoslovakia, but also outside of the country. It had two larger grandstands (both exist to this day) and a promenade for spectators surrounding the elevated cycling track. Contrary to most stadia at that time, it didn’t have landfill under the curvers, they were erected on concrete. And while the stadium overall was indeed designed by Czechoslovak architects, the cycling track was a German creation. In this configuration the stadium offered 15,000 capacity and was indeed full on numerous occasions. When it comes to football, it was particularly popular during the heyday of SK Pardubice (top tier in 1937-1946). But it also held athletics, cycling, even volleyball and motorcycle speedway, especially the Memoriál JK Lobkowicze. As time went by, sports in Pardubice lost the glory. SK Pardubice stopped playing here in 1959, Dukla followed suit in 1961 and from 1970s the cycling section was discontinued. While in 1988 a hotel was created in the west stand, it couldn’t change the fate of this venue. In 2000 the cycling and running tracks were demolished and two temporary stands were built behind both ends. Aimed at providing proper conditions for newly formed Slovan, they were used only until 2006, when the club was relocated. Current FK Pardubice found the stadium too dilapidated to use and had to choose much smaller Pod Vinicí. In the future Stadion Letní will become a football-specific one, even though both grandstands from 1931 are to be retained as historical monuments. The main western one will provide bulk of the facilities needed to meet domestic and basic international criteria, but some alterations are planned. There will be new front rows created where the old cycling track used to be, while the football field will be moved towards the grandstand, onto what used to be the running track. All three remaining sides will receive continuous but small stands, partially covered. This way an all-seating capacity of 4,600 people (1,500 covered) should be created. Outside there’s room for four lighting masts, 500 new parking places and a training field behind the north end. Interestingly, the old east grandstand will remain outside of the more compact stadium, becoming a lasting evidence of how spacious it used to be. When, how, for how much? The municipality of Pardubice came with the above scenario between 2015 and 2016, while just yesterday they selected architects to complete all of the project. It’s expected to be delivered for CZK 7.6 million (or $300,000) by JIKA-CZ. Building the stadium is much more of a challenge. Along with secondary uses it’s estimated to cost a total of CZK 300 million (or $12 million). For a city of 85,000 people that’s a budget beyond reach without subsidies. The city hall are thus hoping for the sports ministry and football association to participate in the project. If this happens, the whole project might be secured by 2018 and could go under construction. 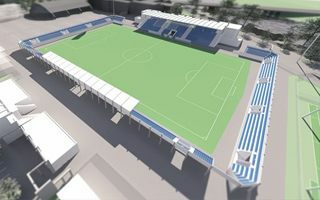 If delivered, the new stadium will become home to FK Pardubice, who are currently playing in the second league.